Northern Ireland’s Transport Minister Danny Kennedy hopes a significant chunk of his legacy in office will be his “cycling revolution”. Yet taxi reform being brought forward by Environment Minister Mark H Durkan threatens to destroy cycling levels in Belfast, by giving vast numbers of taxis priority over bicycles in rush hour. Their gain will be our loss, but what if our government is betting everything on the wrong horse? 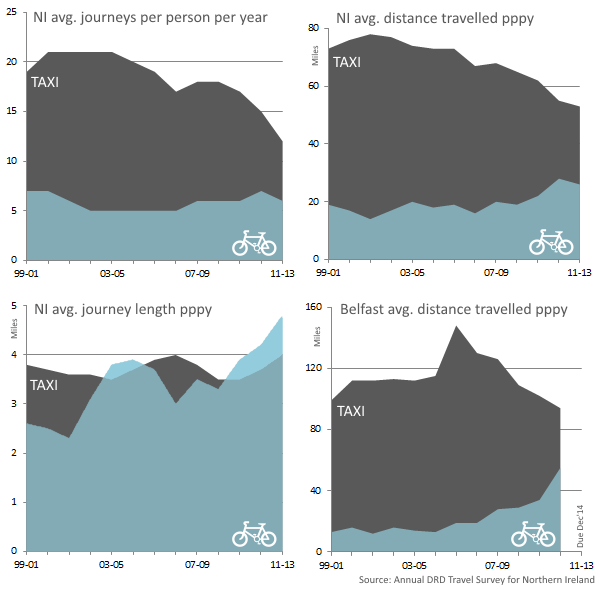 What isn’t widely known is the steep decline in taxi usage over the last 10 years, in parallel to exceptional cycling growth – which is set to propel the importance of the bicycle up alongside and above the taxi sector in key areas of Belfast transport. Belfast taxis saw a sharp 24% decline in commuting patronage between 2001 and 2011 – even in West Belfast where the taxi sector is dominated by cheap, flexible and socially-cohesive taxi bus services. In every area of the city cycle commuting increased – most notably in South and East Belfast, where bus lanes are virtually empty of permitted taxis during rush hours. 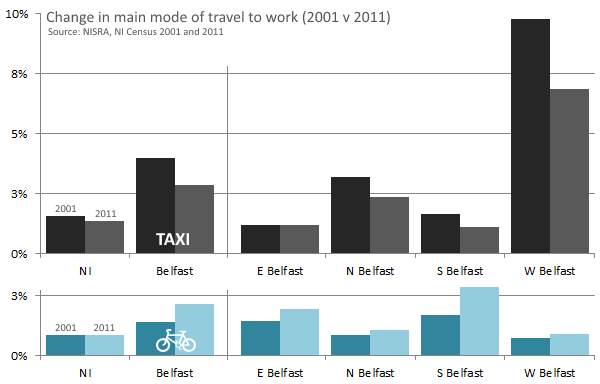 If the taxi decline and cycling increase are indicative of a more general trend in Belfast, cycle commuting looks on course to overtake taxi commuting by the 2021 Census. Admittedly it’s a leap to project forward from just 4 data points, but the irony will be lost on no-one that the ‘cross-over’ year happens to be 2015 – when all taxis are due to be let into bus lanes..
Commuting to/from work might be a narrow look at overall transport usage, but it’s actually very pertinent to this issue, as Belfast bus lanes naturally target only rush hour periods when commuting (along with the school run) creates the greatest congestion. Sharp and spiralling decline in taxi use? So is there an underlying decline in the importance of the taxi sector in NI and, if so, why give taxis privileged access to bus lanes at the expense of thriving cycling levels, which relies heavily on bicycle users’ perception of safety? Maybe the projection above isn’t such a leap if we look at journey trends from DRD’s own annual Travel Survey for Northern Ireland. Taxi journeys have slumped over the 13 years of the survey, from a high of 21 per person per year (pppy) between 2000 and 2005, down to just 12 in 2011-13. Average distance travelled similarly has dipped from 78 miles pppy in 2001-03 to just 53 in 2011-13. Meanwhile cycling shows sustained growth in almost every count since 2007 – the pre-cursor to our Minister’s ‘cycling revolution’. The last graph on Belfast average distance travelled is even more interesting. Taxi travel at 94 miles pppy in 2010-12 is the lowest figure since the survey began. The prominent peak just happened to coincide with Belfast’s opulent property boom of the mid 2000s, followed by a sharp decline tracking the bust years and continuing austerity; draw your own conclusions. And in this period of falling demand for taxis in Northern Ireland, what has been happening to supply? 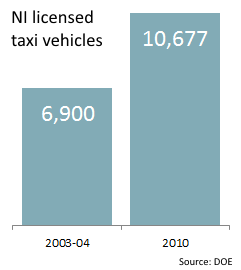 It turns out, there has been a massive expansion in the number of taxis in Northern Ireland. Between 2003-04 and 2010 there was a 55% increase in the number of taxi vehicles licensed to be on our roads. I wonder if DOE knows how many of those additional taxis licensed since 2003-04 were registered as Public Hire outside Belfast (white plates) but actually cruise around the city’s street operating out of private hire depots? We want more people to travel in Belfast by bus, with impressive investment backing this aim up. Already in Belfast, more people are cycling more often and further than ever before – this is worth building upon. At the same sime, there are more taxis chasing fewer passengers than ever before. Why on earth should this declining sector become the dominant user of bus lanes? So why redefine bus lanes? In the Rapid Transit | Taxis in bus lanes article we saw how DRD defines the purpose of bus lanes, which can become quite complex given the different types of vehicles allowed. I think it can be boiled down to two simple reasons for granting access to groups of vehicles – to promote a particularly beneficial transport mode and for increasing the safety of vulnerable road users. Promotion – when prioritising vehicles capable of carrying more passengers than a typical car (buses, taxi buses and many wheelchair accessible taxis) there are clear benefits to society in reduced congestion, more efficient mass transport, reduced land demand in the city centre for parking – among others. 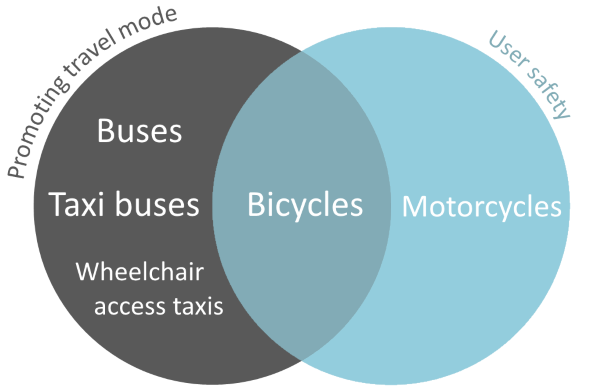 Wheelchair accesible taxis also give disabled customers greater flexibility in travel options, and bus lane access can even be seen as some small mitigation against the increased purchase costs by a taxi driver, encouraging beneficial investment. Safety – by some distance, bicycle and motorcycle users are at greatest risk of being involved in a collision leading to serious injury or death. Bus lanes afford two-wheeled users some calm road space within hectic rush hours. Indeed, the choice to cycle or not is in a large part dictated by the perception of safety, something unlikely to put many people off driving or riding as a passenger in a bus or taxi. Bicycles sit neatly in the middle of this spectrum, almost the perfect bus lane users. This space is actively used to encourage more cycling in Belfast, and safety needs are catered for by relatively empty space in the busiest periods on our roads. The question for both Mark H Durkan and Danny Kennedy is simple – where do you see 4,000+ (mostly saloon car) taxis fitting into this picture? Is anyone calling for a ‘taxi revolution’? Are we actively encouraging people to make more taxi journeys in Belfast? If so, the evidence shows a clear trend in the opposite direction. Is there an obvious need to increase safety for taxi drivers or passengers, above any other user? Hardly, and certainly no arguments on this point featured in the DRD consultation on taxis in bus lanes. Even worse, letting 4,000+ taxis dominate bus lanes impacts on all other users’ benefits as shown above – increased competition reduces the attractiveness of bus transport and risks the £100m public investment in Bus Rapid Transit; any chance to use bus lane access as a tool to increase the supply of wheelchair accessible taxi vehicles is lost; historic taxi bus routes risk being drowned out of existence; and the obvious reduction in safety for vulnerable users will hit the ‘cycling revolution’ hard. In the year since taxi reform was paused, DOE have rolled back on this position – why? In face-to-face meetings I’ve had with DRD officials over the last 18 months the message has been clear – DOE’s taxi reform is giving DRD a ‘hospital pass’, forcing a change which the ‘Transport’ Department has no great desire to implement. The unintended consequences of levelling the playing field for all taxis is an end to the fine balance among current bus lanes users – a once-in-a-lifetime irreversible decision to benefit a taxi sector in apparent decline, at great cost to growing sustainable transport. Of course taxis are, and will remain, an important component of the overall transport system in Belfast and Northern Ireland. But the overall contribution of the taxi has reduced, while the bus and bicycle have gone from strength to strength. The challenge is now for Environment Minister Mark H Durkan to work with the Regional Development Minister Danny Kennedy to find a better way forward – for the greater good.